Pamper yourself this easy hair hot oil treatment. Leaves dry, flyaway hair, smooth, shiny and healthy. 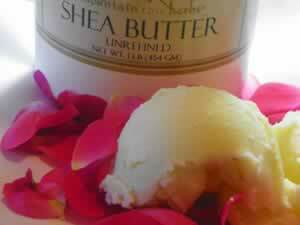 Good for all hair types, shea butter is a natural product of Africa, and especially valued by its women. Tamanu oil is the traditional choice of the Polynesian people, who use it to repair hair from sea, sun and wind damage. Rosemary is perhaps the most famous oil of all for its hair conditioning properties, be sure to add it after the heating process, so it's goodness does not evaporate away. Combine the shea butter with the liquid oil and heat in a microwave safe dish, or over a low heat on the stove. Heat until just hot, but cool enough to be comfortable to apply to hair and scalp.